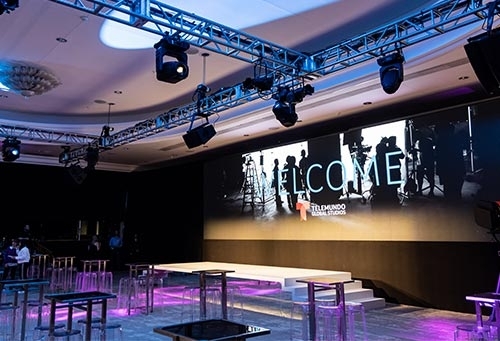 Most recently TruPixel handled Telemundo’s big screen presentation for attendees at NATPE Miami. “The network showed 15-minute clips from four new series in a conference room at the Eden Roc Miami Beach Resort,” Orizondo explains. “We set up a 40x12-foot LED video screen and ran the main and backup 4K sources through Ascender along with live camera feeds capturing the shows’ stars who were present in the hall. VIO did the processing, and the Dante card routed all the sources for the 5.1 surround.